I have a new planner! I looked back at my post from this time last year and I was writing about last year's planner and expecting to have stopped using it by February. Actually, although there were a few times during the year when I did forget decide to see how I'd get on without one, I found that between it and my Google calendar which we use as a family, I was reasonably organised, and when the new download became available, I decided to use it again this year. My planner is from Krafty Owl and I use this version as I prefer my weeks to start on a Monday rather than a Sunday. It's a free download and I get it bound at our local Office Outlet (one of those big sells-anything-to-do-with-offices-and-stationery stores); to be honest, it probably costs me as much in ink and paper as it would do to buy a ready-printed planner, but I like the layout of the pages which are pretty basic with lots of space for me to write my endless lists, and it doesn't make me feel guilty about not having written down goals or drawn mindmaps to focus my first two weeks of January year. 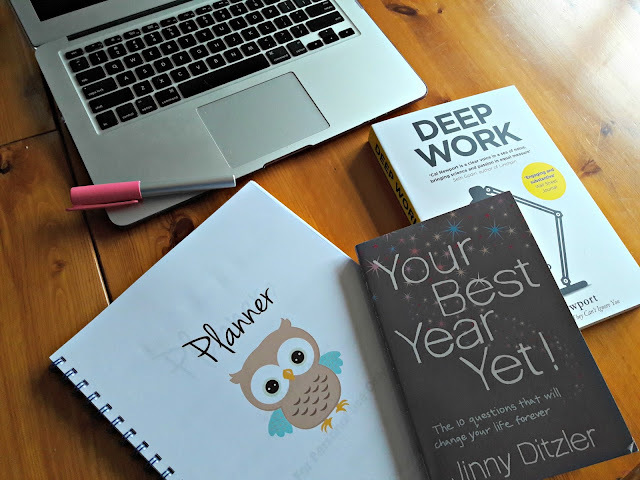 I've also fished out my copy of Your Best Year Yet by Jinny Ditzler. This is a cracking book for making you think about what's important to you and what you want to focus on in the next year in all aspects of your life, not just business-type goals. There are still no mind maps or demands to create goals that always end up making me feel more anxious than motivated, but there are ten questions that you answer and by the time you've put it all together, you've got a picture of how you want to spend your energy which is an interesting way of looking at it all. I did all the questions a couple of years ago when I first bought the book and was fascinated with how it all turned out, but I never quite found the time to do them the next year (ha!). Never mind, I'm working my way through the book again now and I'm going to set aside some time next week to write down all the answers to the questions again (the book says it takes 3 hours which is nothing, really, out of a whole year which makes it all the more embarrassing to say that I didn't have the time to do them previously) and then make sure it all fits with my planner. I've bought myself another couple of books to read this year, too. The first one is Deep Work by Cal Newport, which I'm hoping is going to help me deal with my Olympic-standard propensity for procrastinating. Yes, yes, putting off doing more things by reading a book, but according to the cover, by the time I've read it I'll have "rules for focused success in a distracted world". That sounds very grand but if the basis of it is "spend less time on Facebook" then I'll be cross, because that's where the Winwick Mum Sockalong groups are and I've no plans to stop spending time there, but we'll see. I'll keep you posted! The other one that I've had my eye on for a while is by Kate Atherley and is called "The Beginner's Guide to Writing Knitting Patterns". I've written quite a few patterns now and I always do my best to make them as good as they can be, but there's always more to learn and often books aimed at beginners have more information than those aimed at intermediates as there's much that's assumed. I'm also a big fan of Kate Atherley and her patterns so I'm looking forward to reading this just because I can, as much as anything. I don't try to knit socks for Christmas presents these days as I know that I often don't have the time to hit that 25 December deadline, so this year I used my IOU letter and gave balls of yarn instead. 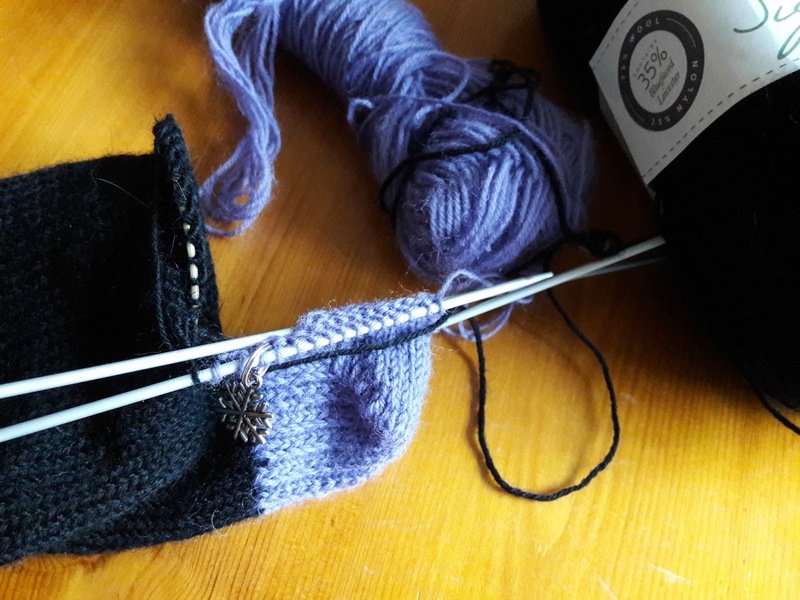 Big daughter and her boyfriend are both lined up for a pair of (matching) socks this year (yes, I must be mad, offering to knit another pair of size 14 socks without being under the influence of too much Sangria as I was last time!) and I've noticed that some of my husband's socks are wearing a bit thin too so he was also the recipient of a ball of yarn. "Ooh, black yarn - that must be a present for you," he said, handing it back to me. Yes, I suppose it is, really! We've been watching the Amazon TV series Extant which has been good knitting TV (not so scary that I've had sweaty palms which is no good for socks, interesting enough that we've watched "just one more episode" which has meant time for more rounds) and they're coming along nicely. This purple heel will forever be the "James Bond heel" as we watched Spectre last night (I love Christmas holidays, an excuse to watch far too much TV!) and I ended up unpicking it more than a few times as I was too busy watching the action to watch what my needles were doing. I'm quite partial to a James Bond film every now and again; I used to watch them with my Dad when I was younger and then he would watch with us at our house and although we did always prefer the earlier films, this one was pretty good. They always make me think of Christmas - or possibly New Year's Eve, although I remember a few years when the only film that seemed to be shown before the midnight countdown was Zulu which was definitely not one of my favourites! So, resolutions for this year? Have you got any? I don't tend to bother these days as I know that the likelihood of vowing that I'll get up early every morning to do some yoga stretches or I'll polish the windows every week are likely to get forgotten very quickly. However, I do like to set myself some intentions - be kind, be honest, be grateful, be helpful, be polite, that sort of thing - which feel much more useful than polishing the windows and are actually far easier to remember to do. I do have one resolution, though, and that's to keep knitting socks, write the blog, write patterns and tutorials, be in the garden ... I've counted them as one resolution as they all make me very happy and there's nothing wrong with having a resolution that makes you happy, is there? Better than a wholesome, window-cleaning-type one that isn't going to make it past the second week in January! The first tutorial for this year will be coming up as soon as the light is good enough for me to start videoing (oh, does that count as procrastinating? I haven't read the book yet! ;) ) and it's continuing the theme of developing new skills with the basic Sockalong pattern. I don't know if my mission to take over the world one sock at a time is really a resolution or a declaration of something more sinister (mwah ha ha) but I think that a world full of people with cosy toes could be a much nicer place so don't be thinking that I'm turning into a Bond villain after all this TV watching. If you're in the North East of England, I'll be heading up your way at the end of January to visit Woolaballoo in Durham (actually, I'm super-excited that it's in Langley Park which is mentioned in a Prefab Sprout album title and I'll finally get to see what the place looks like!) so do come along and say hello. I'm going to be there on Saturday 27 January and it'll be great to see you! Here's wishing you a wonderful year full of good things! I loved the Kate Atherley book. So much of the advice is really simple and obvious - but most of it had never occurred to me before. Even though I've not yet written a pattern, it's made me more discerning of the patterns I read. I felt the same the first time I visited Langley Park over 20 years ago!! It was a good album. 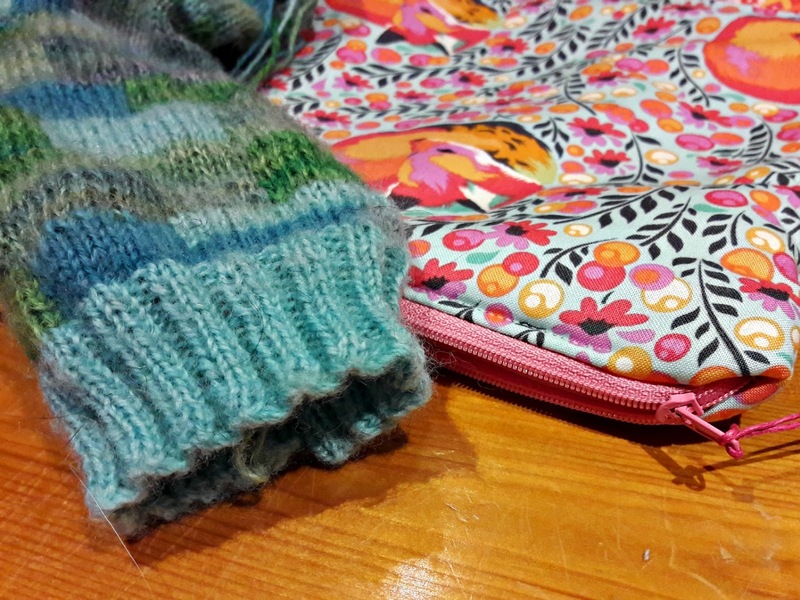 My resolutions include making sure I finish a few knitting and crochet projects I have started, continue knitting socks now I have discovered how great it is, and to be kinder to myself - make sure I'm not trying to do too much, make sure I'm doing things for me and not just my family, etc. I don't do resolutions but I do want to knit socks! My mum, now sadly departed, tried teaching me years ago but I didn't get far before giving up. Despite knitting virtually anything I don't recall her ever making any socks. more socks! awesome! can't wait! need to cast on another pair too. I love that aqua sock with the blocks of color. Please tell us more about it. Thanks. Wishing you a very Happy New Year! I have put "Your Best Year Yet" on my to get books list! For me and my sister! 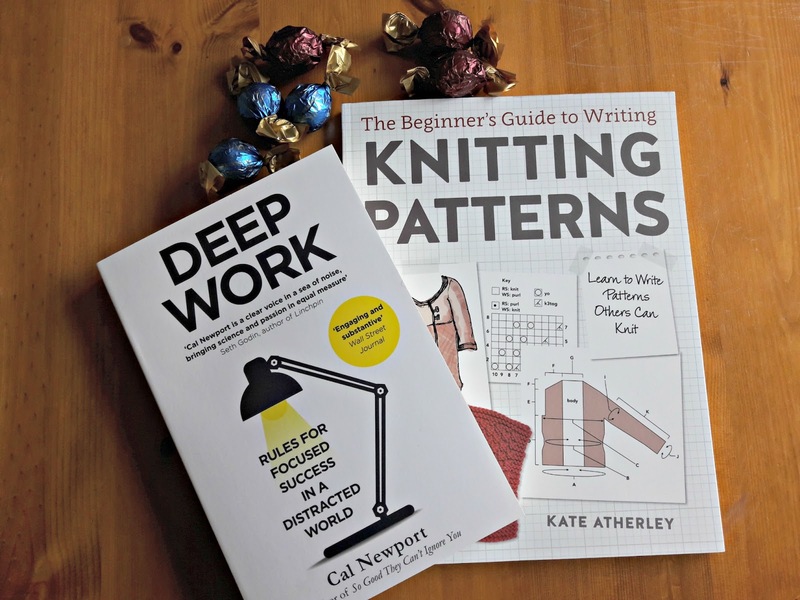 I love Kate Atherley's books and patterns and before I discovered Winwick Mum's Sockalong I was a devoted KA sock knitter - and still am in between your lovely projects! I treated myself to her book of mittens before Christmas - essential for a fellow dog walker. I love your idea of gifting balls of wool to those you will be knitting for - may have to think of that next Christmas when I start running out of time with my projects - I did start in July in 2017! Anyway - am also trying to be kind, grateful, helpful and other good and happy things too in 2018 - you will be inspiring me! I love it that for Christmas you gave yarn and an IOU to knit socks. I thought about that and almost did. But I was afraid I might not be able to pay up. I decided to just knit and then give when I can and wish them Happy late Christmas! I'm a fairly new knitter but will take on anything. I'm currently knitting one of Katie Davies designs. I'm slow but steady with the stranded knitting. It is a lot of fun!! Good for the mind. And our Aga goes out from time to time. Ours is gas and vented directly to the outside. I do like it. It gives you space in back between the hobs to keep things warm which is very nice seeing as how we only have two ovens, not the four with the warming oven. But a good wind outside can whip out your flame. A cold Aga on a cold Indiana winter morning is a very sad thing. Thankfully it has held it's flame lately. Our night temperatures have gotten down to -20F with the wind. Very cold here right now. So, am very thankful for good wool socks and a warm Aga. Now I just need to knit some for my husband and son (now that I've mastered it, well, gotten better at least). Thank you for your blog entry! Nice to hear from your side of the world! didn't know there was a knitting shop in Langley Park - I have been up that way to buy fabric though. might try to get through though as it is nearly my neck of the woods. Wishing you a year filled with fun and happy times including some learning moments to keep the grey cells ticking along. Happy New Year, Christine. I so love your writing style and your blogs are a delight to read. I have put " the best year yet" on my book list for this year, and as I get older, I think intentions are better than resolutions - I intend to be kind and gentle to all and everything around me and of course, taking over the world, one sock at a time! Here's to a wonderful 2018! Hi Christine, I have only recently found your blog and am loving it as we seem to share all the same hobbies. I have been knitting for about 65 years and think I am reasonably skillful but have never ever made a pair of socks - until now. I have bought some Adriafil Calzasocks wool in glorious shades of turquoise, blue and purple and really enjoying following the sockalong pattern. Just about to turn the heel (week 2) so wish me luck. So very pleased I found you and thank you so much for all the tutorials. Happy New Year.